Yesterday was Twelfth Night, the traditional end of Christmas festivities, and the day by which you’re supposed to have taken down all the decorations. We’re back to normal, but there are a couple of houses in the neighbourhood that are still holding on to the festive vibe. We actually had one of these at work yesterday. We’d been discussing the phenomenon of “cake culture” and whether we should encourage or discourage the appearance of cakes in the office as part of a commitment to healthy eating. Afterwards, of course, I went to a bakery and rocked up with one of these guys, but we managed to agree it was OK, as this was a cultural cake, rather than a celebration of cake culture, so we were fine with that. There is also a bit of fun that goes with this cake. Traditionally a ceramic bead would be added to the filling, and when the cake is cut and served, the person that finds the bead becomes king or queen for the rest of the day. 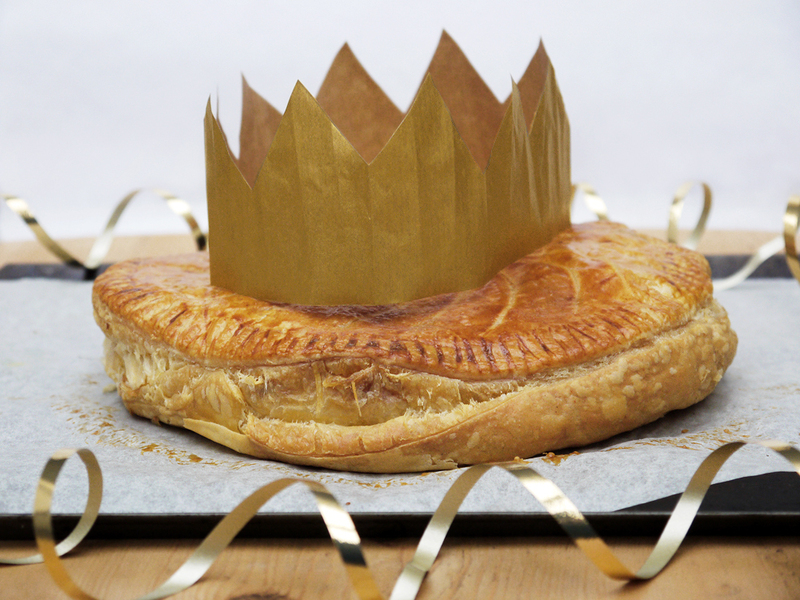 If you buy a galette, you will usually get a golden crown to go with it, which the lucky monarch can wear to impress their subjects. Now, you might be thinking that hiding a piece of ceramic in a cake is not a great idea if someone is hungrily tucking into it and they, oh, perhaps value their teeth? And you’d be absolutely right. As it turns out, I was the lucky king for a day at work, and it was a bit disconcerting to discover there was a piece of stone lurking in there. If you’re going to make one of these, I think the best way is to keep the tradition of something in the cake, but perhaps add a whole almond instead. All the fun, none of the risk of dental damage. This is a very simple recipe to make. If you’re the sort of person that makes their own puff pastry, that’s great, but I am not one of those people. I bought mine from the store, and it makes life a lot easier. You just have to make the filling, then put it between two discs of pastry and bake it. But to make up for buying the pastry, I did make my own paper crown! 1. Preheat the oven to 180°C (355°F) and line a baking sheet with greaseproof paper. 2. Make the filling. Cream the butter until soft, then add the sugar and beat well for a minute. Add the egg, almond extract and vanilla extract and mix until light and fluffy. Fold in the ground almonds, then add the rum and mix well. 3. Roll out the puff pastry so that you can cut two discs of at least 20cm, but try to get 25cm if you can. Cut out the two discs, and transfer one to the baking sheet. Use some of the beaten egg to moisten the edge of the pastry disc. Put the apricot jam in the middle and spread evenly, avoiding the egg. 4. Gently spoon the filling onto the pastry disc and spread it evenly – you might not need all the filling, particularly if the pastry disc is on the smaller side. Pop an almond or lucky charm into the mixture. 5. Place the other pastry disc on top, and working from the centre, use your hands to gently pat it down, getting rid of as many air bubbles as you can. Finally press down on the edges where you brushed the beaten egg to get a good seal. Crimp with a fork, then trim with a very sharp knife to get a neat edge. 6. Brush to top of the galette with beaten egg. 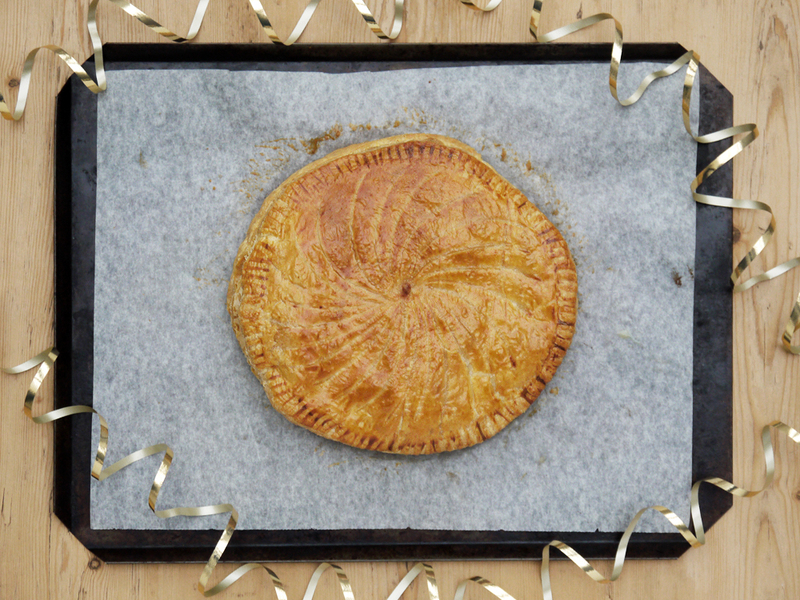 Make a hole in the centre with a skewer to allow steam to escape, then use the back of a sharp knife to make a pattern on top of the galette. 7. Bake the galette for 25-30 minutes until puffed up and golden. You many need to turn it round half-way to get an even bake. 7. Remove from the oven and leave to cool. Warn your guests about any ceramic or metal lucky charms in the galette before serving!